During this lecture we looked at five much-repaired and worn out Viking ships that were deliberately sank (scuttled) around the year AD 1000. 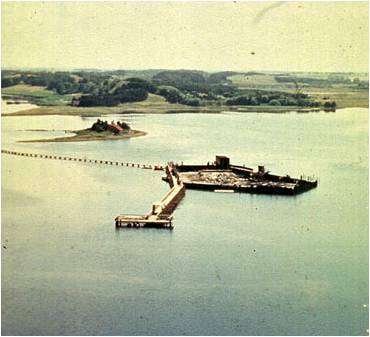 They were filled with stones and deliberately sunk in order to block a ship channel giving access to the town of Roskilde, in Denmark, thereby protecting the town from enemy raiders. The site of the scuttled ships lies near the village of Skuldelev, hence the they are called the Skuldelev ships. The Skuldelev finds are important because little to nothing was previously known about Viking merchant vessels in which long distance trade was conducted. In 1924, fishermen from the fishing village of Skuldelev cut a new passage through the channel to make it deeper, for larger vessels. They found large mast step and keelson. 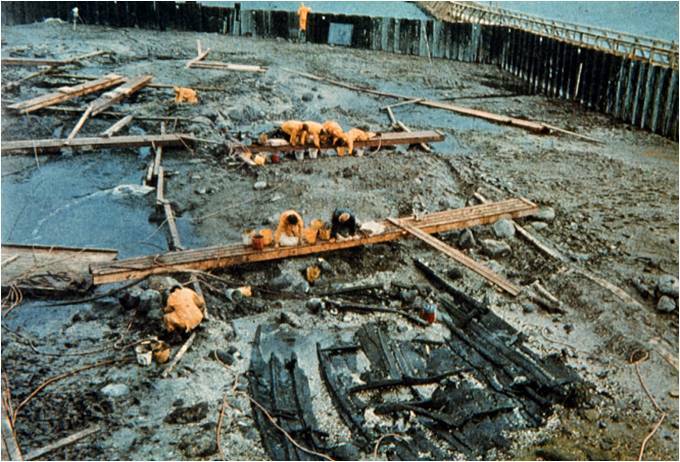 It wasn't until the summer of 1962 that an excavation was conducted to retrieve the rest of the timbers. A coffer dam was constructed around the vessels, the water was pumped out and the excavation was done like a land dig, with sprinklers to continually keep the wood wet. After they were excavated, the ships were studied and reconstructed at the Viking Ship Museum in Roskilde, built specifically for these ships. Prior to the Skuldelev finds, it was widely believed that the Vikings who colonized Iceland, Greenland, and North America sailed off in ships like the Ghosted ship. The discovery of Skuldelev 1 put an end to this misconception.